Smokey the Bear will tell you that only you can prevent forest fires, but he never met the mad Fire Elemental. You may not be able to prevent the burning baddie from attacking, but you can stop him from destroying the Dream Forest. 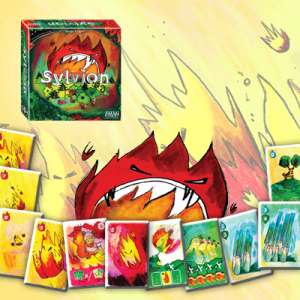 Sylvion by Z-Man Games is a solo or two-player cooperative tower defense card game. Players build a deck use a drafting system and play cards in their hand by paying for them with other cards. There are animals, trees, and fountains, all at your disposal to help put out the fire. Fire cards are randomly drawn from four piles and are considered a wave attack from the enemy camp. You must defeat the fire cards by playing stronger, more powerful forest cards. When all of the fire cards have been destroyed, your marker must be on a green space to show that you’ve saved the forest. If you are on a fire card, the forest has been burned down. Silvion is available now for $25 from the company’s website, Amazon, or you local board game store.